Great Kit it keeps you out of the Pro Shop. It worked great changing the cover stork on my Lock and Hammer. Love the Clean and Dull it had both balls working great and if they were just out of the box from the factory. Great for at the lanes quick surface adjustment. For weekly home maintenance of cleaning, and surface mods or touch ups as well. Polishing w/ elec drill & bonnet is not as good as a ball spinner is. Can't really get the burn in required for hi-gloss. Can it do a full/deep resurface? NO - Can it replace a ball spinner? NO - Can it modify a surface quicker than by hand? YES The rotating ball cup is really good, so much better than any standard ball cup out there. 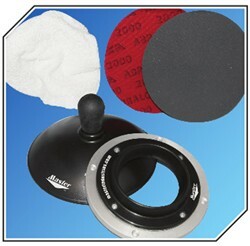 The hand sander is especially useful for applying even/contoured pressure even w/ a ball spinner! i.e. - no flatspots. Great item that is portable & fits in the bag - try that w/ ball spinner! Hello! Unfortunately we do not sell the cup separately. If i remove the Soft Touch knob can i then attach my drill to it? Hello RC. Yes, you can remove the knob and attach your drill to use. Is there other grit pads available for purchase or do they only make the 500 and 2000 for the kit? Due to the time it takes to produce the Master Surface Master Package ball it will ship in immediately. We cannot ship this ball outside the United States.